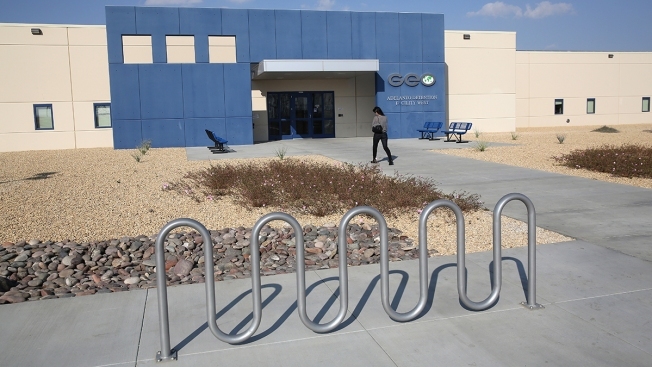 A family member walks into the Adelanto Detention Facility on November 15, 2013 in Adelanto, California. The family of a 27-year-old man who died after a stint at a California immigration detention facility says they want answers about what happened to him. Melissa Castro said Wednesday that she was called Feb. 8 by Immigration and Customs Enforcement and told her husband had a "passing out episode" and was in the hospital. Castro says when she arrived she found Jose Ibarra Bucio in the intensive care unit with a brain hemorrhage and a coma he never woke up from. Castro says immigration authorities released her husband from custody about two weeks later as his health was deteriorating. He died March 21 after the family removed life support. Immigration and Customs Enforcement says Ibarra was released for humanitarian reasons and declined to discuss his health condition. Immigration authorities say Ibarra was taken into custody from a state prison following a conviction for fleeing a traffic officer while driving recklessly. Ibarra had come to the U.S. from Mexico as a child.